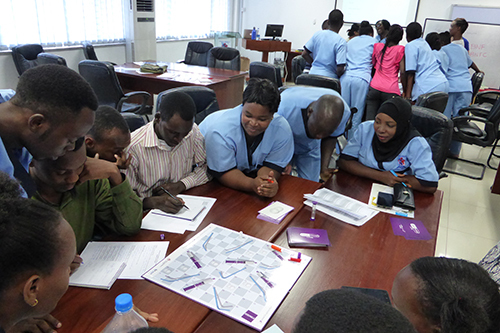 Developed at City, an educational training game on drug dosages and safety may have helped influence practice at Beira Central Hospital, Mozambique. Academics from the School of Health Sciences at City, University of London, have developed an educational board game in which teams take turns answering medication safety questions and calculating drug doses. The game transforms what is often an individual and high risk decision into something fun and participatory. 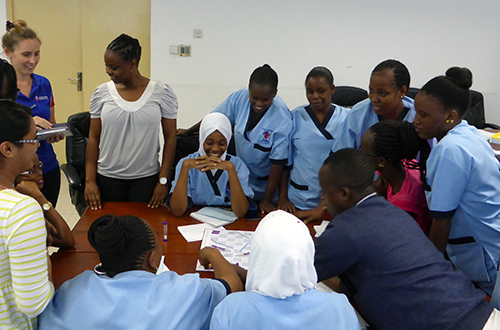 Known as Drug Round™, the board game was recently taken up by nurses at Beira Central Hospital in Mozambique during a training session on drug calculations. The ‘Snakes and Ladders’ based game translated culturally and linguistically for players (known as ‘Cobras e Escadas’ in Portuguese, the official language of Mozambique), who participated enthusiastically, laughing, contributing to group solutions together, asking for advice from pharmacists and using calculators to accurately calculate doses. The game is also a discreet way of players’ gauging drug calculating abilities though a simple count of correct and incorrect answers. We were trying to think of a way of making a rather ‘dry’ subject more engaging. We came up with the idea of a board game based loosely on snakes and ladders. When we piloted it with our students, they really enjoyed it and became quite competitive! As it worked so well, we got it professionally manufactured so it could reach a wider audience. The project was jointly funded by Enterprise at City and Health Education England and further refined and developed into an educational board game in collaboration with Focus Games Ltd, a company making fun and educational board games for health professionals. City is now keen to bring the Drug Round™ game to a wider international audience, by translation of this training aid into different languages. Drug Round™ can be used by healthcare professionals that prescribe, dispense and administer drugs such as medical, optometry, dental and pharmaceutical professionals.